around rome on the back of Vespas. Kirsten Harty: Still a little tired but feeling renewed and energized from my trip! Thanks Fleace, and thanks to all the wonderful women I had the pleasure to meet! Monifa Ilandgul Hendrickson: Pizza will never be the same...pasta will never be the same...shopping will never be the same...partying will never be the same...! Thank you Bella Fleace!...you've changed lives with your vision and I am personally grateful for the opportunity to experience this adventure with you all! Bella for Life! Rebecca Adams: Fleace, thank you for planning such an amazing tour! The short time I shared with all the beautiful Bellas exploring Italy has made an indelible impact on my life in many ways. I am refreshed, motivated and inspired to move forward with what I believe to be my mission. Bellas, although I didn't get to spend quality time...me with everyone I still feel a sisterhood with each of you. I plan to keep in touch with each of you and continue to form our friendship. You all are amazing and I thank you for blessing me with the opportunity to get to know you. Rhonda Peltier: It was a great pleasure meeting all of the Bellas. I had a fabulous time seeing Italy with all of you. Fleace I take my hat off to you for organizing such a wonderful tour. I have to say that I have truly fallen in love with Italy. Joyeux Willams: BELLA KAPPA BELLA! I love you forever and thanks for all that you do! You are phenomenal muah! Selma V. Banks: Thank you Fleace!!!! You are Remarkably DYNAMIC Woman... and I feel blessed to have just spent time around you. You are a lesson to me... to go after ones dreams in life because they can become a most certain reality. Keep Being the Fabulous Fleace That ONLY YOU Can Be!!! MUAHHHHH!!!! ;)! Mikelle Willis: This trip was absolutely amazing! I met such wonderful women and I had a blast. Thank you so much for this life changing experience Fleace'!!! Alythe Coley: Fleace, I can't say thank u enough for such an amazing time, u r truly a wonderful n inspirational woman!!!! Thank you so much for amazing time in Italy, this was more than a vacation, what a wonderful, spiritual, emotional and inspirational journey with 67 amazing black sistahs, words cannot express my gratitude. Love ya! LaToya Bryant White: As I sit here with my CANCKLES on swole (I had to take my ankle bracelet off) I would not of changed anything about this trip for the world. Me and my mom had a BLAST BLAST BLAST and me some FRIENDS we will definitely have for LIFE. Thank you so much Fleace........you are the BOMB!!!!!!! Sophia Sayers: Thanks so much Fleace for putting together such an amazing experience for 60+ exceptional ladies-- the logisitics of which must have been mind-numbing! I met such awe-inspiring people, saw places I'd only dreamed of and took part in activities that I'll remember forever -- it totally solidified my love of Italy and I'm now strategizing my way back to Rome early next year. Right now going through some major Italy withdrawal thanks to you and this awesome tour! Thanks again! Kia Clark: Thank you and all the bellas again for celebrating my birthday with me. This was one of the best!!! YAY!!!! Chelsea Comeau: Thank you Fleace!!! It was truly a blessing and a pleasure. Through your tour you have encouraged me to follow my heart, live life to the fullest and have no regrets. Know that you are appreciated. I wish you all the best and plan to keep in touch;-) Go Fleace, Go Fleace, Go Fleace (loved the soul train line in Rome) lol! Veronica Crowe: I miss Italy so bad!! As another Bella said....Plane, trains, water taxis, metro, ferries, cruise ship, and bus.....this was the vacation of a lifetime. And Italians relly know how to party. ; ) I miss all the Bellas!!! My only question is WHEN ARE WE GOING BACK? I am so glad I decided to go. I can't imagine traveling with any other group besides yours. Nyra Constant: I am back from the most amazing trip of my life ---LOOOVVE ITALIA!!! 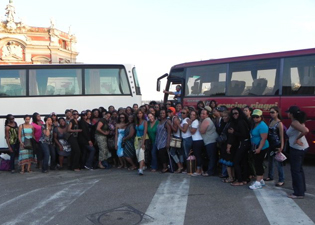 67 black women moving about Venezia, Roma, Capri, Napoli, Sicilia and Firenza in unison and with love. I miss you Bellas! Experiencing severe withdrawals right now. Arhemia Fidai: How am I suppose to get use to life in the states after my amazing trip to Italia? Regina Crenshaw: This trip was the bomb! We had a blast, non stop fun. Shopping for days ...beautiful weather, gorgeous men.....lovely country. You should start planning immediately. Cassandra Morris: ‎67 amazing bellas walked the red carpet while vacating in Italy and caused all kind of traffic jams/damage (in a good way ;-) LOL. Bellas, did you see the look on their faces they pulled out every electronics ever made to record our uniqueness some even asked for our autograph. Thank you all for letting me share your space for 10 memorable days. Tomecia Weaver: I have truly fallen in love with Italy and wishes everyone could visit.. wants everyone to know that Italy is even more beautiful than you could have dreamed! The weather is awesome and the food & shopping are the greatest! Vonetta Greene: Wonderful experience that you will never regret or forget! Moyosiore Olude: " I've had the pleasure and good fortune to share an amazing hoilday with 60+ beautiful, accomplished and inspirational Bellas from around the globe. Thank you for sharing the trip of a lifetime. Fleace said it best, Bella for life! Shawna Washington: That was one of the BEST trips ever for many reasons and I thank you and the other Bellas for that. I can't say enough how honored and blessed I felt to have been given the opportunity to be in the company of such amazing women. Dianna Reed: THANK YOU for organizing such a FANTASTIC trip!